From the late 1970s epigraphers and linguists began to work together to analyse the language(s) represented in the Maya hieroglyphs. One of the first of these collaborations was a 1979 conference held at the State University of New York in Albany (Justeson and Campbell, eds. 1984). During the conference both epigraphers and linguists suggested that the inscriptions recorded a form of Cholan (now spelled Ch'olan) and Yucatecan (now spelled Yukatekan) languages. Since the Albany conference researchers have unravelled many linguistic issues concerning the language(s) recorded in Maya hieroglyphic texts. Among these the most important (and hotly debated) concern the phonology (the sound system) and morphology (word formation) of the language(s), and which of the Ch'olan and Yukatekan languages were the language(s) involved in the inscriptions. In fact the Mayan languages are among the best documented in the world, and ironically this was initially due to the Spanish conquerors of New Spain and Guatemala. When they arrived in the New World in the years following the conquest, the Spanish clergy faced a huge task. 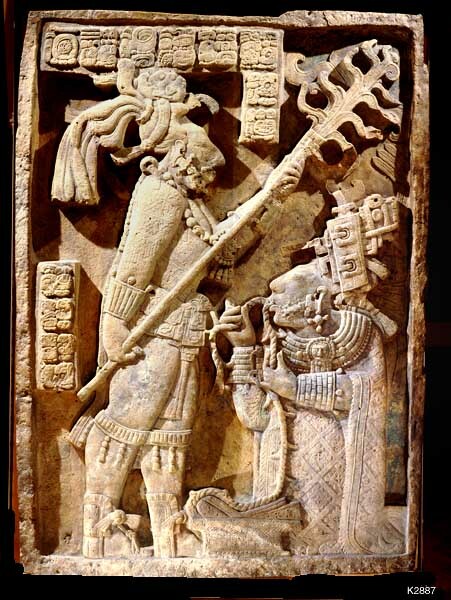 They fervently believed that the Maya Indians needed to be converted to Christianity in order to save their souls. However there were very few priests to accomplish the mission.4 The priests and friars quickly adopted the solution of learning the Mayan languages in order to proselytise to the Indians, and many of them compiled vocabularies, wrote grammars, and translated catechisms and other religious tracts in order to help the priests and friars who came after them. The result is that we have good documentation of many Mayan languages from the 16th and 17th centuries. These early works complement the many excellent linguistic studies of the modern languages and also our increasing knowledge of the language(s) of the Classic Maya hieroglyphs. These eight sub-groupings of the Mayan languages are reflected in thirty or thirty-one languages (by most linguists' count) that have survived to modern times6, in addition to two languages that were documented by 16th-century Spanish friars but which are now extinct. Another way in which Mayan languages have been classified is in somewhat larger groupings based roughly on geography: the so-called 'lowland' Mayan languages, and the 'highland' languages. The lowland Mayan languages comprise the first four of the above sub-groupings: Wastekan, Yukatekan, Ch'olan, and Tzeltalan. The last three of these appear to be implicated as possible languages of the hieroglyphic system. Ch'olan can be demonstrated to be most closely tied to the Maya hieroglyphs, but Yukatekan and (much more rarely) Tzeltalan are also represented in the inscriptions of some sites. 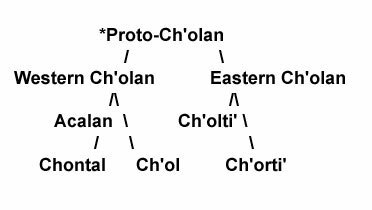 The Ch'olan sub-group of Mayan languages has three modern descendants: Ch'orti', Ch'ontal, and Ch'ol. Two extinct Mayan languages referred to above also belong to this sub-group: Ch'olti' and Acalan. There is some debate over how all these languages are to be classified internally. 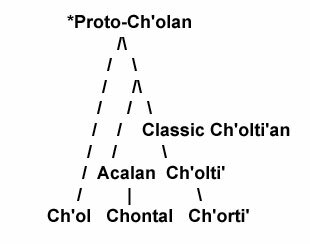 The traditional model (see for example Kaufman and Norman 1984: 81) has a two-branch classification with Acalan and its modern-day descendent Chontal comprising, along with Ch'ol, the 'Western Ch'olan' branch, and Ch'olti' and Ch'orti' as the two sub-branches of 'Eastern Ch'olan', as shown below. In the 1980s and early 1990s, based on analyses of Maya hieroglyphic grammar, it was widely held that the language of the Maya hieroglyphs was closest to Ch'ol. A more recently proposed classification of the Ch'olan languages has been put forward by John Robertson (1992: 3; 1998: 10-11; see also Stuart, Houston, and Robertson 1999: II-39), who argued that the language of the hieroglyphs (for which Robertson, David Stuart, and Stephen Houston have since proposed the label 'Classic Ch'olti'an') is the direct ancestor of colonial Ch'olti', which in turn is the ancestor of modern Ch'orti', as illustrated in the following chart. At present, there is still some debate over these two models. Obviously they have implications for the language of the hieroglyphs: was the hieroglyphic language closer to modern Ch'orti' and colonial Ch'olti', or was it a common ancestor to all of the Ch'olan languages? Because of the continuing debate we refer to the language of the inscriptions as 'Epigraphic Mayan', which we believe is a more neutral designation than Proto-Ch'olan or Classic Ch'olti'an. While the Ch'olan language Epigraphic Mayan is clearly the most important one relating to the hieroglyphs, it is clear that it was not the only one involved. It has long been known that many northern inscriptions were written in an ancestral form of Yukatek Mayan, and recently it has been argued that some inscriptions at Tonina have constructions in an ancestral form of Tzeltal. Thus far these three-the Ch'olan 'Epigraphic Mayan', Yukatek, and Tzeltal-are the only three languages that have been identified in the glyphs. Another topic that is currently hotly debated is whether Epigraphic Mayan had long vowels, and (if so) whether they were represented in the writing system. Different proposals abound. Terrence Kaufman and William Norman (1984) argued that the distinction between long and short vowels had been lost by proto-Cholan times. Stephen Houston, David Stuart and John Robertson (1998; Robertson, Houston, and Stuart 2004) suggested that Epigraphic Mayan (or Classic Ch'olt'ian as they call it) had retained the distinction from Proto-Mayan, and the loss of vowel length only occurred at the end of the Late Classic Period, or from the late eighth century, AD. In addition, Houston, Stuart, and Robertson (1998) proposed that Classic Maya scribes indicated long and other types of complex vowels by the process they called 'disharmony'. Many epigraphers accept the basic proposition of disharmony, but there is disagreement over details (Lacadena and Wichmann 2004). Various reconstructions are currently circulating, and for beginners trying to come to grips with Maya hieroglyphic spelling rules and conventions the situation is at present somewhat confusing. This is because the field of Maya epigraphy is still in the very active phase of decipherment and interpretation. It is a very exciting time for epigraphers and linguists, for we are getting ever closer to an understanding of the subtleties of Maya Hieroglyphic writing and the Epigraphic Mayan language. In the Maya Hieroglyph Dictionary we have opted for the conservative choice of not indicating long vowels in the headings of the basic entries. We have, however, indicated other proposed spellings of the entries (incorporating long and complex vowels) in the section entitled 'Narrow Transcription(s)'. Another recent discovery concerning the phonology of Epigraphic Mayan was made by Nikolai Grube (2004) and others who proved that both the hieroglyphic language and the writing system made a distinction between 'h' and 'j'. We accept this distinction and so the Dictionary has entries listed under both 'h' and 'j'. Also, epigraphers realised that several sounds were not always written by Maya scribes (in other words, the Maya could 'under-spell' some expressions). These under-spellings can be detected both through occasional examples of 'full' spellings and through linguistic reconstruction. For example, in the Dictionary we have indicated the infixed pre-consonantal 'h' in passive constructions (Lacadena 2004), and also some word-final consonants that were not usually written by the ancient scribes. Intense debate is going on concerning the topic of morphology of Epigraphic Mayan. Currently there are disagreements on the issues of tense, aspect, and discourse in Maya hieroglyphic texts. Some scholars (Robertson, Houston, and Stuart 2004) suggest that Epigraphic Mayan had a tense system (to distinguish past, present and future time), while others argue that time was indicated by the use of adverbs ('now', 'later', 'ago', etc.) rather like ancient Chinese (Wald 2004). In the sections for each Dictionary entry entitled Meaning(s) and Morphological Analysis, we reflect the 'adverbial' system. This is not to say, however, that the debate is over. 1 It has been conventional to use the term 'Maya' when referring to things cultural, archaeological, or epigraphic, and in contrast to use the term 'Mayan' when referring to language. 2 Earlier studies include those of Pimental (1862), Orozco y Berra (1864), Berendt (1876), Stoll (1884), Charencey (1890), Gatschet (ca.1895 [see also Campbell 1973]; 1900), León (1901), Thomas and Swanton (1911), Lehmann (1920), Gates (1920), Rivet (1924), Schmidt (1926), Kroeber (1939), Mason (1940), and Halpern (1942). 3 More recent studies include those by Swadesh (1961), Kaufman (1964; 1968; 1969; 1972), McQuown (1956; 1964), Suárez (1983), Campbell (1988), and England (1994). A useful summary of the history of the classification of Mayan languages can be found in Campbell (1977: 74-101). 4 In 1536, there were probably only about sixty Spanish priests and friars in New Spain. In 1545three years after the founding of the Spanish capital at Méridathe first Franciscan friars arrived in Yucatán: they were four in number! Even by 1580, there were only thirty-eight priests in Yucatan (Farriss 1984: 93; Clendinnen 1987: 47-54). The Yukatek Maya Indians had come to convert a native Yukatek Maya population estimated to have been over one million on the eve of the conquest. 5 Perhaps the major dissenting view is proposed by John Robertson (1992; 1998; Stuart, Houston, and Robertson 1999), whose views differ mainly over the Chujean and Q'anhob'alan sub-groupings and the internal relationships within the all-important Ch'olan sub-grouping. 6 One of them, Chikomuseltek, is now extinct; there were only a few speakers by the early decades of the twentieth century, and by the 1970s only odd words were remembered by people in the original Chikomuseltek region (Campbell 1988:199). 1876 Remarks on the centres of ancient civilization in Central America and their geographical distribution. 1973 Gatschet's classification of Mayan languages. International Journal of American Linguistics 39(4): 250-252. University of California Publications in Linguistics, Volume 81. 1988 The Linguistics of Southeast Chiapas, Mexico. Papers of the New World Archaeological Foundation, Number 50. Provo, Utah: New World Archaeological Foundation, Brigham Young University. 1890 Étude sur la langue Mam. Proceedings of the 7th International Congress of Americanists: 389-403. 1987 Ambivalent Conquests. Maya and Spaniard in Yucatan. 1994 Autonomía de los Idiomas Mayas: Historia e Indentidad. 1984 Maya Society Under Colonial Rule. 1920 The distribution of the several branches of the Mayance linguistic stock. Appendix XII to: The Inscriptions at Copan (by Sylvanus G. Morley): 605-615. Carnegie Institution of Washington, Publication 219. Washington, D.C.: Carnegie Institution of Washington. ca.1895 Manuscript (written in German) in the Gates Collection, Brigham Young University Library. 1900 Zentral Amerikanische Sprachstämme und Dialekte. 2004 The orthographic distinction between velar and glottal spirants in Maya hieroglyphic writing. In:The Linguistics of Maya Writing (Søren Wichmann, ed. ): 61-81. Salt Lake City: The University of Utah Press. 1942 A theory of Maya t-sounds. Carnegie Institution of Washington, Notes on Middle American Archaeology and Ethnology 1: 51-62. Cambridge, Massachusetts: Carnegie Institution of Washington. 1998 Disharmony in Maya hieroglyphic writing: linguistic change and continuity in Classic society. In: Anatomía de una Civilizatión: Aproximaciones Interdisciplinarias a la Cultura Maya (Andrés Ciudad Ruiz, Yolanda Fernández, José Miguel García Campillo, Maria Joseja Iglesias Ponce de León, Alfonso Lacadena García-Gallo, and Luis T. Saenz Castro, eds. ): 275-296. Publicaciones de la Sociedad Española de Estudios Mayas No. 4. Justeson, John S., and Lyle Campbell, eds. 1984 Phoneticism in Mayan Hieroglyphic Writing. Institute for Mesoamerican Studies, State University of New York at Albany, Publication No. 9. Albany: Institute for Mesoamerican Studies, State University of New York at Albany. 1964 Materiales lingüísticos para el estudio de las relaciones internas y externas de la familia de idiomas mayanos. In:Desarrollo Cultural de los Mayas (Evon Z. Vogt and Alberto Ruz L., eds. ): 81-136. México, D.F. : Universidad Nacional Autónoma de México. 1968 Review of Languages of Guatemala, by Marvin Mayers. International Journal of American Linguistics 34: 224-231. 1969 Tecoa new Mayan language. International Journal of American Linguistics 35: 154-174. Centro de Estudios Mayas, Cuaderno 5. 1984 An outline of proto-Cholan phonology, morphology, and vocabulary. In: Phoneticism in Maya Hieroglyphic Writing (John S. Justeson and Lyle Campbell, eds. ): 77-166. Institute for Mesoamerican Studies, State University of New York at Albany, Publication 9. 1939 Classification of the Mayan languages. In: Cultural and Natural Areas of Native North America: 112-115. 2004 Passive voice in Classic Mayan texts: CV-h-C-aj and -n-aj constructions. In: The Linguistics of Maya Writing (Søren Wichmann, ed. ): 165-194. 2004 On the representation of the glottal stop in Maya writing. In: The Linguistics of Maya Writing (Søren Wichmann, ed. ): 103-162. 1901 Familias Lingüísticas de México. Mexico City: Imprenta del Gobierno Federal en el ex-arzobispado. 1940 The native languages of Middle America. In: The Maya and Their Neighbors: 52-87. New York: D. Appleton-Century Company, Inc.
International Journal of American Linguistics 22: 191-195. 1964 Los origenes y la diferenciación de los mayas según se infiere del estudio comparativo de las lenguas mayanas. In: Desarrollo Cultural de los Mayas (Evon Z. Vogt and Alberto Ruz L., eds. ): 49-80. 1864 Geografía de las Lenguas y Carta Etnográfica de México. México, D.F. : Imprenta de S. M. Andrade y E. Escalante. 1862 Cuadro Descriptivo y Comparativo de las Lenguas Indígenas de México o Tratado de Filología Mexicana. 3 volumes. México, D.F. : Tipografía de I. Epstein. 1924 Langues de l'Amérique Central. In: Les Langues du Monde (A. Meillet and M. Cohen, eds.). Collection Linguistique Publiée par La Société de Paris 16: 629-638. Paris: La Société de Paris. 1992 The History of Tense/Aspect/Mood/Voice in the Mayan Verbal Complex. 1998 A Ch'olti'an explanation for Ch'orti'an grammar: a postlude to the language of the Classic Maya.Mayab 11: 5-11. 2004 Tense and aspect in Maya hieroglyphic script. In: The Linguistics of Maya Writing (Søren Wichmann, ed. ): 259-289. 1926 Die Sprachfamilien und Sprachenkreise der Erde. 1884 Zur Ethnographie der Republik Guatemala. Zürich: Druck von Orell Füssli. 1999 Recovering the Past: Classic Mayan Language and Classic Maya Gods. The XXIIIrd Linda Schele Forum on Maya Hieroglyphic Writing. Austin: The University of Texas at Austin. 1983 The Mesoamerican Indian Languages. 1961 Interrelaciones de las lenguas mayenses. Anales del Instituto Nacional de Antropología e Historia 13: 231-267. México, D.F. : Instituto Nacional de Antropología e Historia. 1911 Indian Languages of Mexico and Central America and their Geographical Position. Bureau of American Ethnology, Bulletin 44. 2004 Telling time in Classic Ch'olan and Acalan-Chontal narrative. The linguistic basis of some temporal discourse patterns in Maya hieroglyphic and Acalan-Chontal texts. In: The Linguistics of Maya Writing (Søren Wichmann, ed. ): 211-258.